Key difference: Sunflower and Palm oils are edible vegetable oils obtained from their respective sources, i.e. Sunflower oil obtained from crushed sunflower seeds; Palm oil is obtained from oil palm plant. Food being the major ingredient in life is incomplete without oils. Sunflower and palm oils are one among the various cooking oils occurring in the nature. These are rich in their content, according to which they are preferred in foods. They consist of those constituents that are rich in many issues and problems. These are also used in many cooking methods. Sunflower oil is non-volatile in nature; it is made of by extracting the oil contents from crushed sunflowers seeds. It was first produced industrially in Russia. Along with cooking applications, this oil also has numerous advantages over the skin, and hence it is used in cosmetic formulations as an emollient. It is a monounsaturated (MUFA)/polyunsaturated (PUFA) mixture of mostly oleic acid (omega-9)-linoleic acid (omega-6) group of oils. The oil also contains a considerable amount of vitamin E, sterols, squalene, and other aliphatic hydrocarbons, terpene and methyl ketones (chiefly methyl nonyl ketone). Also, it is known to be one among the most commonly used oils in cooking. This oil has proven to be beneficial in many cardiovascular and skin related issues; hence it has numerous applications other then cooking also. Its nutritious composition makes it one of the healthiest oils for consumption as well as application on skin and hair. 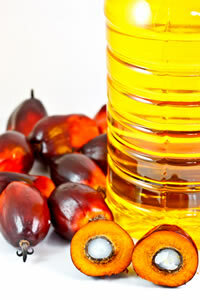 Palm oil is the most common and cheapest oil in all the oil categories; it is obtained from the palm oil plant. It is natural vegetable oil obtained from the mesocarp, which is a reddish pulp of the palm plant fruit. Primarily, it belonged to the Africa, and it was earlier produced from the the African oil palm Elaeis guineensis. Also, palm oil is a common cooking ingredient in the tropical belt of Africa, Southeast Asia and parts of Brazil. It is most highly used for commercial purposes in many parts of the world, due to its cheap cost and probable availability. The palm oils have high contents of fats and hence these oils also have importance in biodiesel (as palm oil methyl ester). Palm oil is composed of fatty acids, esterified with glycerol like all fat. Unlike all fat, palm oil is high in saturated fatty acids, which are solid at room temperature. Sunflower and palm oils are naturally occurring oils, which are obtained by their respective ingredients and constituents. There are quite diverse factors in both the oils, i.e. 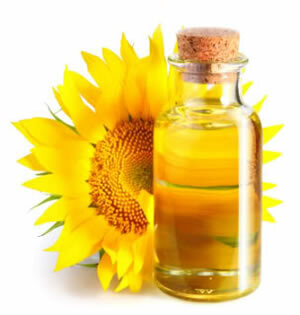 sunflower oil has the quality to cure the cardiovascular disorders, whereas the excess consumptions of palm oils increase the risks of cardiovascular disorders. Another factor which differentiates both the oils is the cost factor, as palm oils are considered to be the cheapest of all oils. Both the oils have vast applications in their respective fields, for example: sunflower oil is used as emollients; while palm oils are used in production of biodiesels. Excess consumption of palm oil results in obesity which further may give rise to many health issues and problems.